When college buddies Eric Prum and Joshua Williams tinkered with an empty Mason Jar early last year, and transformed it into a hip-looking cocktail shaker, they had no inkling they'd created a potentially million-dollar idea. 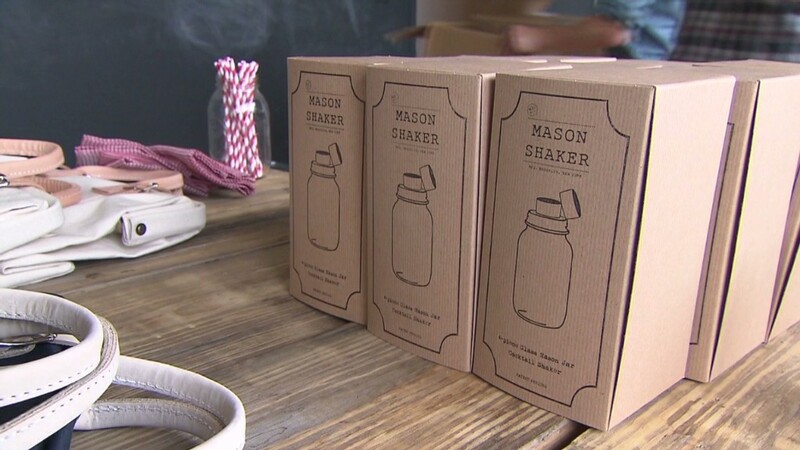 Their Mason Shaker -- a Ball Mason jar fitted with a custom lid that converts it into a cocktail shaker -- rolled out in West Elm stores last November and the initial order of thousands sold out in just three weeks. By January, sales of the shaker online and through West Elm stores had reached $250,000. The contract calls for the retailer to carry their Mason Shaker through at least the end of this year. "It's been an amazing year-and-a-half for us," said Prum. The friends first conceptualized and designed the Mason Shaker last January. In July, they approached crowdfunding site Kickstarter to raise a modest $5,000 in startup capital to manufacture parts and produce an initial supply of the shakers. Prum, 27, and Willams, 28, blasted through that goal, raising $74,738 from nearly 2,000 investors in a month. "We were shocked," said Prum. "This gave us a pretty good idea that people liked our invention." The Mason Shaker wasn't their first entrepreneurial gig. Williams, who studied economics but had a passion for food and cocktails, took a year off from the University of Virginia to study at a culinary institute in Italy. After he returned, he and Prum, a politics and sociology major, started a catering and cocktails company that funded their college lifestyle. "Josh was the driving force behind it but we both cooked," said Prum. "He got us catering jobs for local barbecues, company holiday parties and private events." During these events, the students found that jars worked well for concocting their unique cocktail mixes. "Mason jars are great vessels for that job and you could find them everywhere," said Prum. After graduation, Willams moved to New York and started working in banking. Prum, who played professional paintball, was hired as a sales rep for a Long Island-based company that designed paintball products. There he developed a flair for product design and invention. Despite their new and busy careers, Prum often thought about his fun college ventures with his best friend, and something else -- their makeshift cocktail shaker. He began thinking of ways he could use his product design skills to refine their college-version Mason cocktail shaker. "I made over a dozen tweaks before I got to the one I liked," he said. Happy with the final prototype, Prum and Williams founded W&P Design, a Brooklyn-based product design company, and launched the Mason Shaker project on Kickstarter. Prum works full time as managing partner, while Williams still has his banking job, but serves as an adviser on product development and business strategy. In November, W&P scored a deal with upscale home goods chain West Elm to sell the Mason Shaker as an exclusive holiday product at its U.S. stores, online and through its catalogs. "We hit a home run with our first product," said Prum. That made him rethink their business strategy: "We had to think bigger than one product," he said. They're now designing a collection of bar products inspired by their love of "vintage Southern aesthetic and industrial attitude." They're also collaborating on a cocktail recipe book. Prum expects the Mason Shaker and their other products could drum up sales of a "few million dollars" by the end of the year. The company is already profitable, but it's still very much in startup mode, said Prum. "So we're diversifying, growing our products and we're not taking any money personally from this yet. We're putting it back into the company," he said. "We're hoping for longevity." -- Have you invented a product that's on its way to becoming a million-dollar idea? Email Parija Kavilanz and you could be featured in an upcoming story for CNNMoney.com.